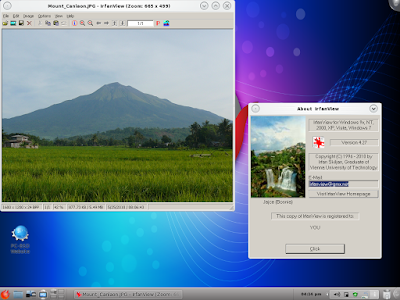 This is a Bordeaux on PC-BSD 8 Screenshot tour. This tour will show you how easy it is to install Bordeaux on PC-BSD and start installing Windows Applications and Games. 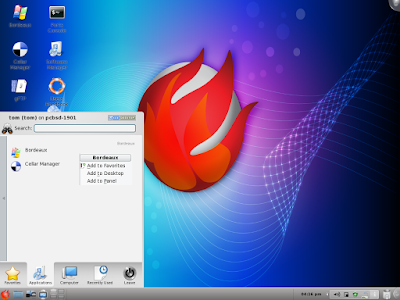 Bordeaux has a single dependency on Zenity once Zenity is installed Bordeaux will install and run on your PC-BSD system. After your purchase of Bordeaux download the installer to your Desktop or Downloads directory. 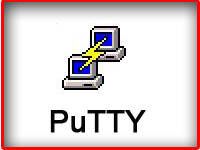 Then install Zenity from the ports collection. Once this is done the install process is ready to begin. 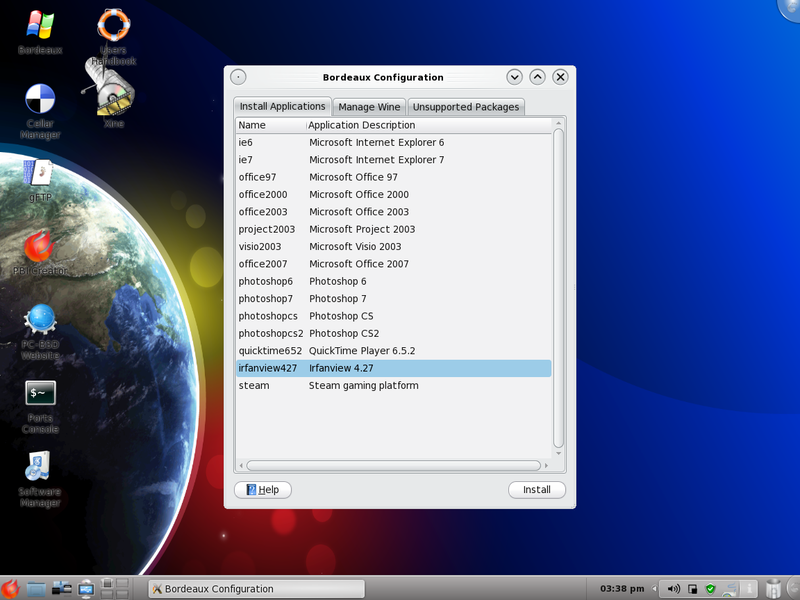 This Screenshot tour is of the upcoming Bordeaux 2.0.6 release. In this release we will start installing the IrfanView Plugins by default. Irfanview has also been upgraded from the 4.25 release to the newest 4.27 release. 2.0.6 will also come with a new Wine release and the newest winetricks and DIB engine releases. Their will also be many more fixes in the forthcoming release then the ones listed here. So if you would like to help support the next release please consider purchasing Bordeaux for Linux, Mac OS X, FreeBSD, PC-BSD or OpenSolaris. Bordeaux downloaded to my Downloads directory. Right click on the Bordeaux .pbi installer and launch it with the PBI Launcher. The PBI Launcher will ask for your password at this stage. Enter your password and the Install will begin. Follow the steps to install Bordeaux. Bordeaux is now installed on PC-BSD 8! Bordeaux will now be listed in your installed software. Double click the Bordeaux Desktop icon to start Bordeaux. Select a app then select "Install" and then wait for the install to begin. Bordeaux might need to download fonts and other libs so be patient while this takes place. 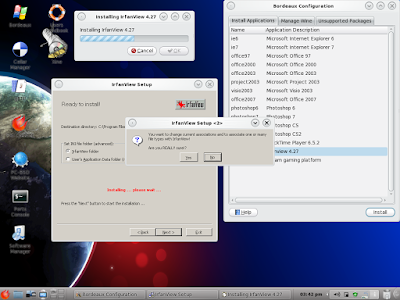 Bordeaux will download the Irfanview 4.27 installer and start the install automatically for you. 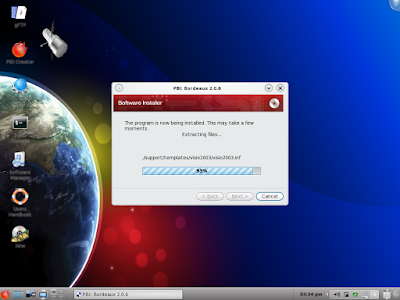 Follow the Irfanview installer instructions and proceed with the install. Dont install the Google Toolbar. Select the Irfanview folder for the Irfanview INI file. Select Yes and procced with the install. 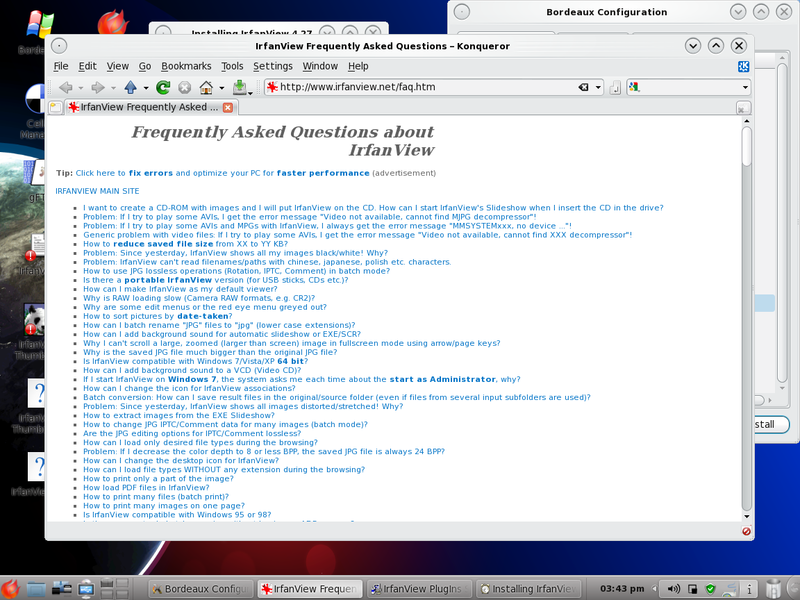 After the install is complete Irfanview will open your default browser and take you to their FAQ. 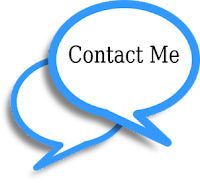 You can bookmark the FAQ at this time or close the page. After you close or minimize your browser the Irfanview plugins install will start. Give this stage a couple minutes depending on your internet speed... Once the plugins installer is downloaded it will begin. The Irfanview plugins are now installed. 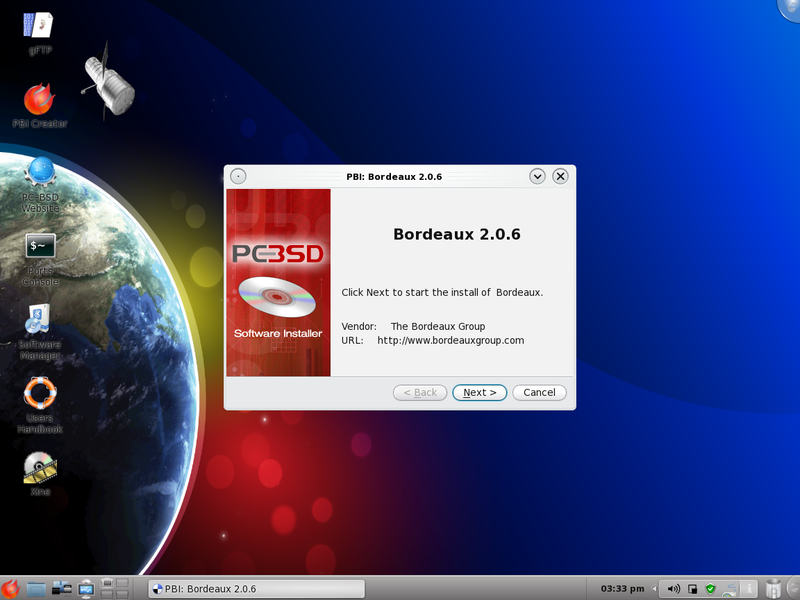 The install is now complete, and at this stage Bordeaux will clean up the .lnk files on your desktop. Select OK to close the progress dialog and then exit Bordeaux. 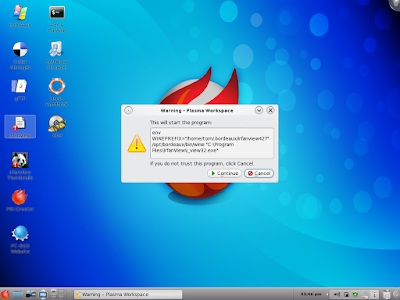 Double click the Irfanviw Desktop icon to start Irfanviw. 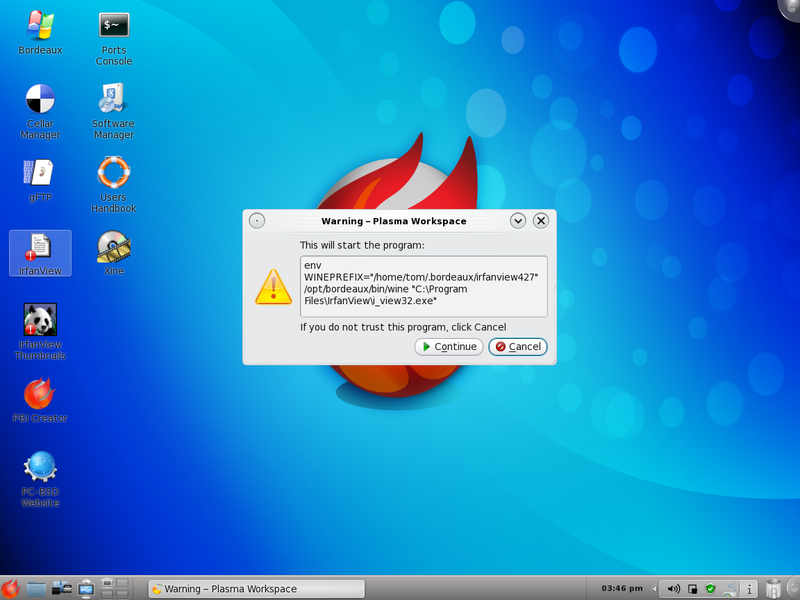 The Warning below is normal, select Continue and Irfanview should start up. About Irfanview and a image of a local Volcano. Bordeaux will also be added to your Applications Menu. Here is the link to the Bordeaux on Mac 10.6 Screenshot tour. Bordeaux also runs on Linux, Mac OS X, FreeBSD, PC-BSD and OpenSolaris. 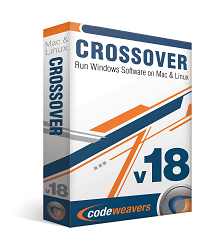 The cost of Bordeaux at this time is only $25.00 for Mac and OpenSolaris and $20.00 for Linux and BSD.